FastCover Grows with Your Business! When your business, farm or enterprise is growing at a rapid rate, it is generally a result of you, as an entrepreneur, pouring all your energy into that growth. Attempting to determine what the next step is to house all that growth can be a daunting task. Do I add onto my building, do I move to larger facilities, how do I become more efficient, are all questions swirling through your mind. As your business grows, plans change, and you need to be able to shift your thought process just as fast. The beauty of a FastCover portable structure is that it allows you to accommodate the need today and be re-located, added onto, or re-configured to accommodate tomorrow’s needs. At FastCover we grow with your business! As a family owned privately held business, FastCover understands that cash flow and your passion drives growth and that there is not always an abundance of free cash to renovate, upgrade or purchase / rent new facilities. Leasing a New FastCover can assist you by providing excellent space for light manufacturing and assembly, or storage of raw material, parts, equipment and finished goods. Leasing allows you to budget for a reasonable fixed “no surprises” payment schedule where all payments can be fully expensed by your business, farm or enterprise. 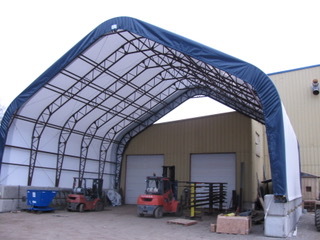 Call FastCover today to discuss your fabric structure project with us. We always appreciate the opportunity to be taken into consideration to work with you assisting in the right solution for You!